Impyrium by Henry H. Neff. HarperCollins, 2016. Paperback. 592 pages. 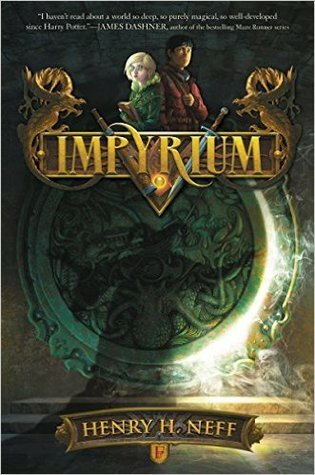 Impyrium may be a middle grade level book, but if you think that means the content is in any way juvenile or simplistic, you would be mistaken. The book itself comes in at almost 600 pages, which is definitely on the longer side as far as middle grade novels go, and it is incredibly in-depth and entertaining. I think the main thing that makes this middle grade is the fact that it is not exceptionally violent or explicit, and most of the main characters are young. The rest of this novel fully embodies a complex fantasy world with abundant elements of world-building, character development, a complex magic system, and so much more. The first thing that caught my attention in Impyrium was the world building. I am in awe at what a complicated and unique world Neff developed in this book. I have since discovered that this is apparently the same world used in a few of Neff's other books, but I have not previously read any of Neff's other work, so it was brand new to me. The divide between the Mehrun (humans that can perform magic) and Muir (humans that cannot perform magic) was distinct and intricately layered. There is a deep, complicated history regarding the political and social issues of this world, and I think Neff handled it all in a perfectly understandable manner. The characters are all wonderfully captivating in their own unique ways. Hob is a clever, crafty young man who I think a lot of people could relate to. He finds himself stuck in unfortunate situations, but he always makes the best of his situations and uses his sharp wit and intelligence to get himself out of them. He is a down-to-earth and realistic boy, and I particularly liked how he was able to adapt to his environment, whether he needed to be more formal and obedient or more brash and casual. And despite his ability to control this actions and emotions well, he is still human, after all, and is often ruled by his own emotions in the end - something I think most of us can understand. The three Faeregine triplets, Hazel, Violet, and Isabelle, each had unique traits that easily set them apart from one another. Violet is mature, stoic, and takes herself seriously; Isabelle is the most neutral and realistic, which elements of maturity and adventure; Hazel, the youngest and the co-main character to Hobbs, is the most unhappy with her royal upbringing and is the most adventurous. I think everyone can find a little bit to relate to in each of these characters, and I enjoyed seeing the dynamic between the three sisters. I also felt that the friendship that forms between Hob and Hazel was extremely realistic and developed in a natural, timely manner that suited the story's timeline well. Due to the immense world-building and extensive amount of details, the beginning of this book does seem to start off a bit slow and confusing as I attempted to understand new vocabulary and norms for this world, but it certainly picked up and kept a fairly steady place. There does seem to be a little bit of meandering here and there, but this only serves to further enforce the world and character development. Overall, I am giving Impyrium four-and-a-half stars! I would certainly recommend this to anyone looking for a strong fantasy read, and although this is classified as a middle grade read, I would recommend it for slightly more advanced readers. I am definitely looking forward to reading more from this series.